Old Trafford, or The Theatre of Dreams the home ground of Manchester United is the largest football stadium in the English Premier League, with a current capacity of 75,731. In honour of 25 years at the club the North stand was renamed as the Sir Alex Ferguson in 2011. Originally founded as Newton Heath in 1878, the club initially played its football matches on substandard pitches at North Road and then Bank Street which severely limited the potential of the team. After the club was rescued from bankruptcy, the club was renamed to Manchester United and members soonsettled on a plot of land adjacent to Bridgewater Canal. Inheriting its name from the local area, Man United’s new ground was designed by famous stadium architect Archibald Leitch. The ambitious plans envisioned a 100,000 capacity stadium, however as the £60,000 budget was soon exceeded, the club were forced to scale down the stadium by 20,000 seats. The original Old Trafford was exceptionally grandiose for its days, and earned the club the nickname of “Moneybags United”. To put the scale of the project into perspective, the new ground required its own railway station be built, and cost approximately 60 times what the average transfer fee of the day was. With the extravagant precedent set, the club continued to renovate the “Theatre of Dreams” in each subsequent decade. After sustaining bomb damage in the Second World War, the club temporarily shared Man City’s Maine Road whilst work was repair work was carried out. Much more influential in shaping the modern day ground was however the publication of the Taylor Report in 1990. Requiring all top-flight stadiums to become all-seating, Old Trafford’s capacity shrunk to just 44,000, and the club even had to abandon plans to construct a new terraced Streford End. Fortunately, this coincided with the club’s unparalleled period of success which was sustained for over two decades. By 2006, the capacity was restored to an impressive 75,635. 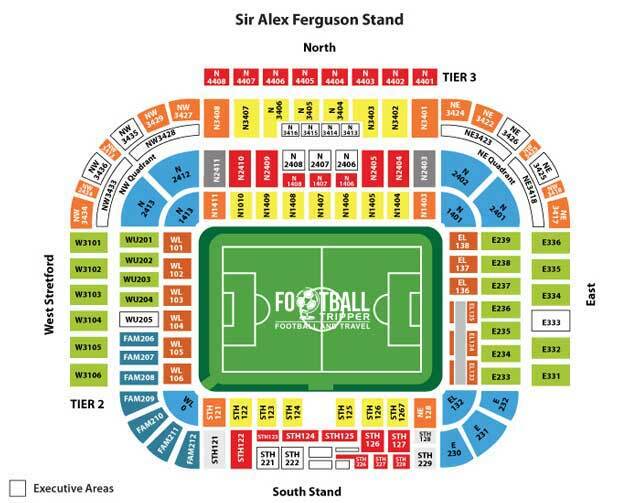 Old Trafford is comprised of the following four sections: The Sir Alex Ferguson Stand (North), the East Stand, the South Stand and the Stretford End (West). 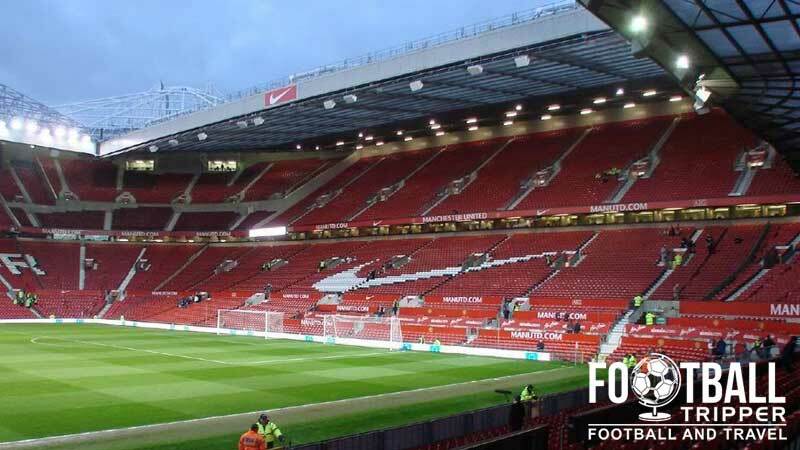 Visiting supporters to Manchester United are housed within the corner between the south and east stands with a standard allocation of 3,000 tickets. 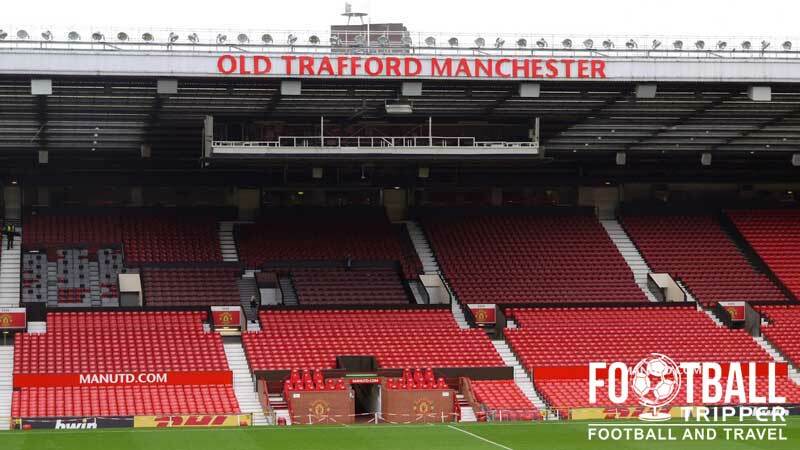 Located opposite the famous Stretford End where a lot of the more vocal United fans congregate, Old Trafford is a great test for the passionate away fans who usually try their best to outsing the home fans. Adjacent to the away section is often where families and tourists gather which means a lot of the singing and “banter” is often one way in nature. To be fair to Manchester United Fans, they do sing pretty loudly when they’re winning or scored but until then away fans often win the noise war. Undoubtedly a world-class stadium, the large capacity of the ground which has grown organically over the years has resulted in seats not being blessed with the most generous amounts of leg-room. For away fans this is slightly irrelevant as it’s often more fun to stand – something which the stewards generally allow. Around Old Trafford you are firmly in Manchester United territory with a lot of the local shops and pubs designing their interiors and signs to reflect this. Three three main pubs near to the ground: The Trafford, Bishops Blaize and Sam Platts, only permit home fans to enter, and it is pretty much impossible to enter if you are wearing visible away colours. Away fans are instead advised to either drink within the centre of town before hopping on the metro or to visit the Quays located north of the ground. This is a gentrified area with several restaurants including the likes of The Lowry Harvester and Lime Bar which has a large outdoor terrace. Within the environs of the ground there are numerous food trucks selling matchday food, and there are also a number of Chippies. On Sir Matt Busby Way there is a Subway, and to the east on Chester Road there is the small White City Retail Park which houses a KFC, Harry Ramsdens and Pizza Hut. The club shop at Old Trafford isn’t just any old club shop, it’s the United Megastore and sells an incredible range of merchandise which has to be seen to be believed. It pretty much has everything the official online store has to offer and possibly more. On Matchdays it’s guaranteed to be open from at least 10,00 am until kick-off and then afterwards for 30 minutes or so. The Megastore also allows fans to browse for around 30 minutes before the official opening time to get a head start on the shopping. I wonder if that’s what David Beckham was doing. 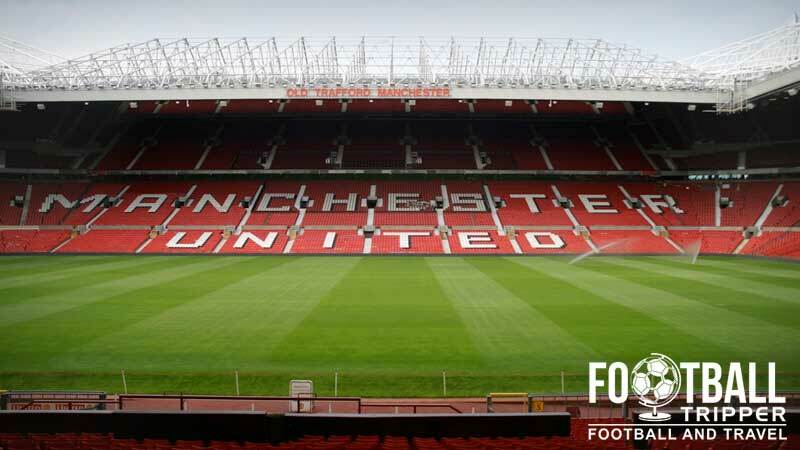 Manchester United’s Old Trafford tour lasts around 70 minutes and takes you through every crevice of the stadium including the dugouts, players tunnel, offices and the museum where the vast array of trophies are safely housed. The tour generally runs for 7 days a week except on matchdays and the day before European matches were it only runs until 1pm. The museum opens from 9.00 am but is closed on weekend matchdays and up to three hours before a midweek match. Pre-booking is not required but never hurts due to the unpredictable demand for the tour. Tickets to see Manchester United can be booked online, and are offered to members of the Manchester United fans club first, before being put on general sale to public. Note: Tickets for under 16s are priced at £13.00 regardless of which stand. 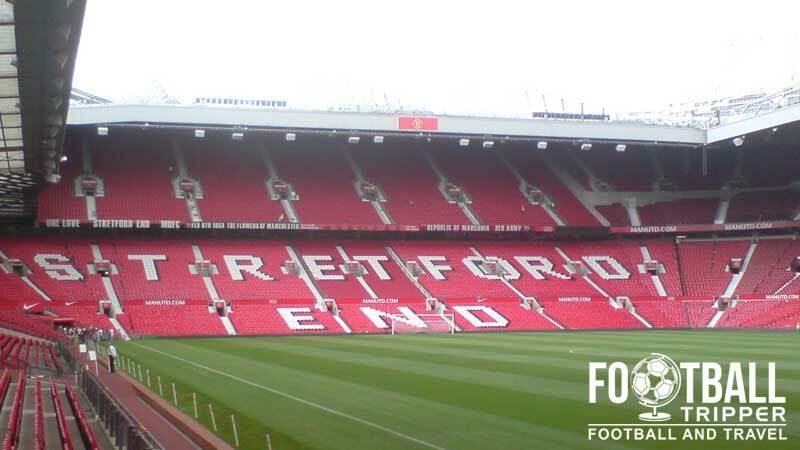 Old Trafford is approximately 2 miles South-West of Manchester city centre in the area of Stretford and the out of town location ensures the ground is highly accessible. Old Trafford by night The East Stand overlooked by the United trinity of Best, Law and Charlton. Sir Matt Busby Way, Manchester, M16 0RA. Parking wise, there are lots of smallish private car parks around the ground which can be used for a few quid. One of the most popular tips shared amongst United fans is to park at Old Trafford Cricket ground for £10 and then walk half a mile to the football stadium. It still requires you to get there early and can be congested upon exit but it is a good safe option which can often suit an extended visit to the stadium on match days. Manchester is served by four train stations: Piccadilly (The largest one), Oxford Road, Deansgate and Victoria. Combined they all pretty much cover the city centre however it isn’t very practical to walk to Old Trafford for most football fans. The easiest (and most popular) way to get to Old Trafford from the city centre is probably the Metrolink which leaves from Piccadilly Railway station taking 15 minutes. The nearest stop to the ground is simply called Old Trafford which is easy to remember. Buses depart from Piccadilly Gardens and you can get the Stagecoach 255, 256 or Arriva North West No 263 to the stadium, taking 20 minutes or so at the cost of a few quid. Manchester Airport is just eight miles away from Old Trafford and once you have landed you can either choose to get a cab (£25.00) or train to Manchester Piccadilly Railway station. This departs every 10 minutes or so, and takes approximately 20 minutes. There are loads of hotels in Manchester and as long as you aren’t obsessed with staying immediately in the vicinity of the stadium, you’ll be spoilt for choice. Staying in the city centre is also advised if you plan to enjoy the nightlife the city has to offer.